English conjugation is deceptive. On the surface, it appears very simple. If you learn Spanish, you spend years trying to master the present, future, preterite, imperfect, and conditional tenses, and if you try to learn Russian, you learn that verbs are modified not just by tenses, but also by aspects, voices, and moods. But English is easy. If I give you brand new verb, say, “slog,” meaning to slack off in writing on your blog (and for the sake of argument, ignore for a moment that you may already be familiar with the verb “slog” in its very different standard English meaning), you would immediately know that I, you, we, and they all slog, but that (s)he slogs, that we all slogged in the past, and that if you have not written on your blog in weeks, or even months, you are currently in the act of slogging. Any other modifications to tense or condition come through in the words surrounding slog rather than in the word itself. Pretty simple. But then there are all these little surprises hidden in the English language, where individual words seem to bend the rules (the rules have been bent, not bended). Sometimes this happens in regular ways, where clusters of words have crossed over from other languages with different, but consistent, rules. And occasionally this happens in ways that are completely unpredictable. One that I used to wonder about often was the verb to go. As long as you stay in the present tense, it acts perfectly normally—I go, you go, we go, they go, (s)he goes, everyone is going. But leap into the past and suddenly no one goed. They went. It doesn’t sound the same, it doesn’t look the same, and it doesn’t seem to make much linguistic sense. That is today’s mystery. Maybe some of you already know the answer, but I ask that you refrain from giving it away before the end of the post. One day, when I was a student at BYU, I was walking on campus and thinking very non-linguistic thoughts. As I was walking, the carillon tower began to chime the hour. 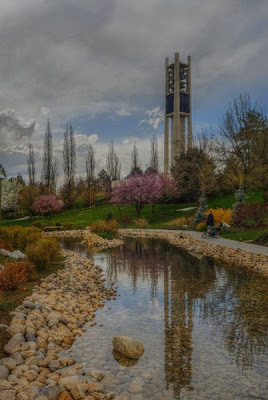 For those of you who don’t know, the BYU bell tower plays the first few phrases of “Come Come Ye Saints” on the hour, and as the chimes broke through my thoughts of boys or weather or mathematics or oatmeal, or whatever I had been thinking at the time, I suddenly realized that I had solved the mystery of the past tense of to go. All thoughts of boys, weather, math, and oatmeal vanished and I couldn't wait to get home and validate my new theory. Can you figure it out? I’m going to pause here and post a pretty picture of the bell tower while you think about it. Got it yet? If not I’ll give you one more hint, which is that I have hidden one other clue in the text above. 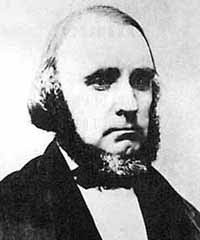 Here’s a picture of William Clayton while you ponder. Got it now? It’s in the last line that the tower plays, “But with joy, wend your way.” And just like when we bend a rule in the past, we say that we bent it, if the saints looked back on their journey many years later, they may have said that they joyfully went their way. Somewhere along the way two words that sounded very different, go and wend, but meant essentially the same thing, became conflated. One got stuck in the present tense, and one got stuck in the past. It makes perfect sense! I thought that was pretty cool, but I’m going to go just a little deeper because it turns out that the interesting details on the irregular past tense of to go don’t end there. Although went got attached to go way back in the 15th century, to go already had an irregular past tense (eode, later yode or yede). In fact, and I thought this was interesting, it turns out that in almost every Indo-European language, to go is irregular. Think for example about conjugating the verb ir, if you know Spanish. And in the meantime, while go has stayed irregular, wend has accommodated the standard English verb tense. So those pioneers would actually have been wrong if they said that they joyfully went their way. Technically, they wended. Wow! I am glad you are so well versed in the English language. I will leave you to deal with the natives.